• On winning the TOUR Championship and the FedExCup: "Wow, it's been a great week and obviously a great Playoffs for me. It's been a great season. It's been a great summer. It just keeps on going in that way. And then very, very happy and pleased with this week, of course. It was a lot of things on the line." • On the FedExCup system: " Well, I mean, the I think the way it turned out now, it was you know, I won twice within the four weeks, and then to win the whole thing it's been a number of years finding that balance. I'm sure you can always look at it from different angles and so on, but I think we've got a system that is very good." • On potentially winning the FedExCup but not the TOUR Championship: "I think it would have been a tough one. Someone asked me yesterday, I think, if I would have felt it was bittersweet if I won the FedExCup but didn't win the TOUR Championship here this week. Given my position that far into the tournament with such a big lead, it probably would have. But I would have been very, very pleased if I would have only won the FedExCup, of course, also. But I think it's given all the good results I've produced over this period of time that put me right up in the top of things when the playoffs started, and then two wins out of four tournaments is yeah, then I'm sitting here with a Combined trophy." • On what his return from a lengthy slump means: "I think it says that I never give up. I went from way, way back down in 2001 and got back up to No. 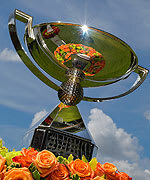 4 (in the world) the week after my win at Sawgrass in 2009. So I'm obviously touching my personal best there. If I keep on playing well, I will have a chance, I guess, later on in the year to be able to improve on that." To read more from Henrik Stenson, please click here. A player known for his performances on the big stages, Henrik Stenson had his greatest year yet in 2013. Entering the season, his two TOUR titles came at the 2007 World Golf Championships-Accenture Match Play Championship and the 2009 PLAYERS. He reached new heights this season, however, as he won both the Deutsche Bank Championship and the TOUR Championship by Coca-Cola to claim the FedExCup. Stenson, the first European to win the FedExCup, had just four top-20 finishes before the calendar turned to July but played his best when it mattered most. After spending much of the year just inside the FedExCup top 50, Stenson turned it on late going 2nd, T2, 3rd in his last three starts before the FedExCup Playoffs to enter the Barclays at No. 9 in the standings. He lost four spots in the Playoffs opener but surged to the top of the standings with his victory at TPC Boston. In the top 5 for East Lake, Stenson controlled his own fate and left nothing to chance as he cruised to victory in the TOUR Championship by Coca-Cola to secure the FedExCup.